Over the bridge and and swing left by the Premier Inn, following the brown signs, on to the B1113. We can see the sea! OK, not actually the ocean but to our left is the Suffolk Water Park. No good for water skiers 'cos it's so flat around here. Another left on an Emin unmade road and lo, 'tis the Waterfront Cafe. 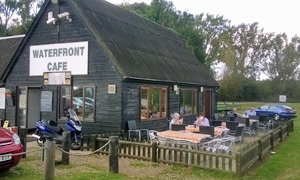 That's what the big white letters say though their website insists this is the Waterside Cafe. Andy parks the Peugeot facing the great lake, an aquatic vista not quite up there with the likes of the View Point Cafe. As per The Bistro, there's far more folk than expected (although no sign of Ma and Pa who reviewed this spot a while back) with a small queue nearly out of the door. Big specials board offers homemade pies, chicken curry, lasagne & chips (classy), all around the sick squid mark. Kev orders his grub before realising he is, like Her Maj, devoid of cash. Luckily he's with friends, all of whom go for a properly classy can of San Pellegrino from a fridge full of less familiar soft drinks. Lots of smoker-friendly outdoor seating but we'll take that corner table, ta muchly. 'Cos I've paid, me and Kev's orders are on the 71 ticket. Andy's on 72. Guess who gets his double egg, ham and chips first? Right. 73 comes and goes before it's our turn. Kev's cod is super fresh and Andy's nearly but not quite defeated by his massive plateful. I've got the much lighter hits-the-spot one-of-each breakfast bap. Tick in the box for Heinz ketchup. Second week running and out of time for dessert. No! Did I spy a Tunnocks product or two up there? Bye to the very friendly team who run the WC. There's no frills here — this sure ain't no Woodbridge Waterfront — but you'll be well fed for a decent price. If it was a car -- Gibbs Aquada. If they were passing by -- Dean Macey.